I have to start out by saying, frizz was never an issue for me, I figure it comes with the territory so when I find something that virtually eliminates frizz then you have my complete attention. I learned about oil rinsing a couple of weeks ago from my girl Alma, and since then, I have tried the process on three wash days with the same results every time. Everybody knows that if you have natural hair and you get the same result three or more times then that process is a keeper! Oil rinsing is an extra step added to your wash regimen where you would add oil to your hair after you shampoo and before you condition. Oil rinsing is different from mixing oils into your deep conditioner because the oil is added to the hair itself, and is considered different from a hot oil treatment because that is done prior to shampoo and oil rinsing is done in the middle. There are two ways to do it, the way I have done so far is to shampoo the hair first and after you have thoroughly rinsed, apply a rich oil throughout your strands prior to conditioning. My oil of choice is Castor Oil but feel free to pick any oil that you prefer. 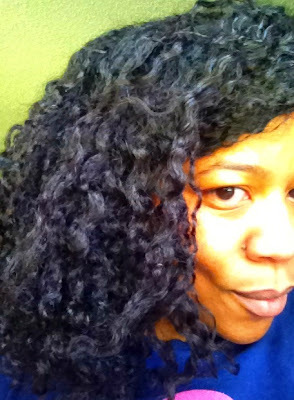 I plan on experimenting with coconut oil and olive oil in the future, but for now I am loving Castor oil. Rinse the oil off your hair with warm/hot water (don’t make the water too hot and cause any shower accidents). Once all of the oil is rinsed, add your conditioner and rinse that with cool or cold water. The other method is to shampoo, rinse, add your oil directly to your hair and add your conditioner immediately after. At this point you have the option of adding a plastic cap and deep condition using heat and then rinsing everything out of your hair with cold or cool water. Hands down the elimination of single strand knots. I know that I will have to look at my hair over a period of time to see if the knots go away completely but so far so good. Is this news to anyone else? Have you ever tried oil rinsing?